Unfortunatelly I didn’t keep that promise but I am very optimistic this will happen in the future especially after we will be able to use the amazing Edge.js library for server side rendering of React.js components. In the meantime I was involved in several React projects and in all of them was using webpack so I had the change to really dig into the tool and learn it deeply. The last personal side project I am working on is a Reactjs application with asp.net 5 as server side platform this time. I really like the new approach from asp.net platform and the flexibility it provides. through tools like bower, gulp and grunt. My sense though is that community walks away from this approach and there is a tendency to use just npm modules even for client side packages and not bower. On top of that more and more projects use npm scripts and webpack for executing tasks instead of gulp or grunt something I really like as it removes a dependency and a corresponding configuration file from the project. Finally I really suggest to watch Jonathan Creamer talk on some advanced features of webpack. One of the most valuable features of webpack is the accompanied development server and the live reload it provides when saving a file. Of course this is not something new as there are tools that doing this already but where webpack-dev-server shines is that does this without reloading the page. This happens by default for stylesheets. When using Reactjs we have exactly the same behaviour by using the appropriate configuration something that is extremelly powerfull as we dont’s loose the application’s state from a full page refresh. What it was frustrated and lead me to create that library is the fact that I had first to start webpack-dev-server and then start my project through Visual Studio or command line in a different platform. but then you end up to have your appication running in a diffrent location than the back end during development and have to solve all the CORS issues. In order to demonstrate webpack in an asp.net 5 in a better way I have created a boilerplate application in Github. Once you copy the repository you need to execute dnu restore and dnu build as usual from the command line to download all the nuget packages and after this npm install to install the required node packages that are a few. After finishing that, you are ready to start the application by executing dnx web. This will start the normal asp.net server but the webpack-dev-server too in the address that is provided in the configuration. If no configuration is present will start on localhost:4000. 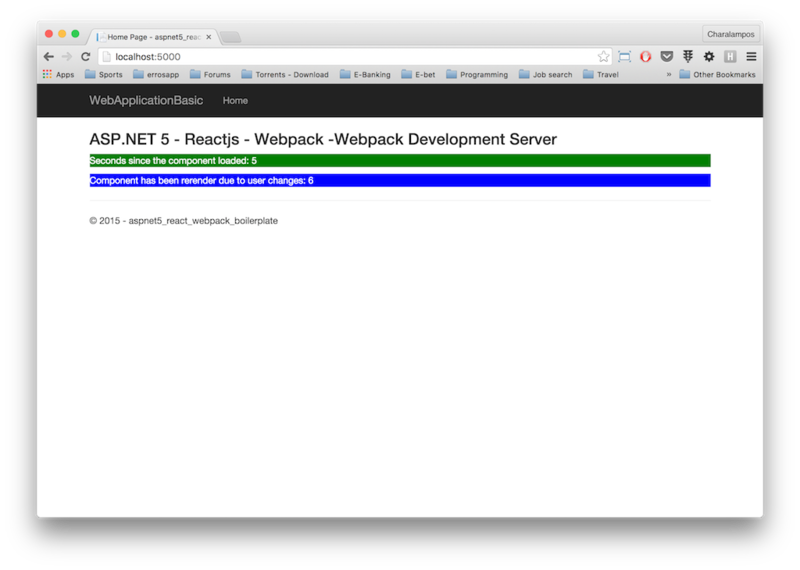 The webpack-dev-server logs to the same console as asp.net does and you can get a nice indication on what is happening. The output is quite simple but it demonstrates most of the features that will be used in a real application as well. It contains a statefull component that has some basic styling through sass. changing the component you can see that the rerender counter will be increased more than time elapsed as any chnage in the component will trigger an extra render. This is a library that should be used only during development environment and should not be part of any production system. To be sure you are staring in a development environment from the command line you need to execute dnx web ASPNET_ENV=Development. As mentioned before there are some other tools that provide live reload functionality. This is a well tested solution for an asp.net 5 application that works cross platform. Webpack is a great tool for preparing the production bundles too as it can handle minification, create separate bundle for vendor scripts and support async loading of the bundles. The tool has many more capabilities and would require a separate blog post to describe it.